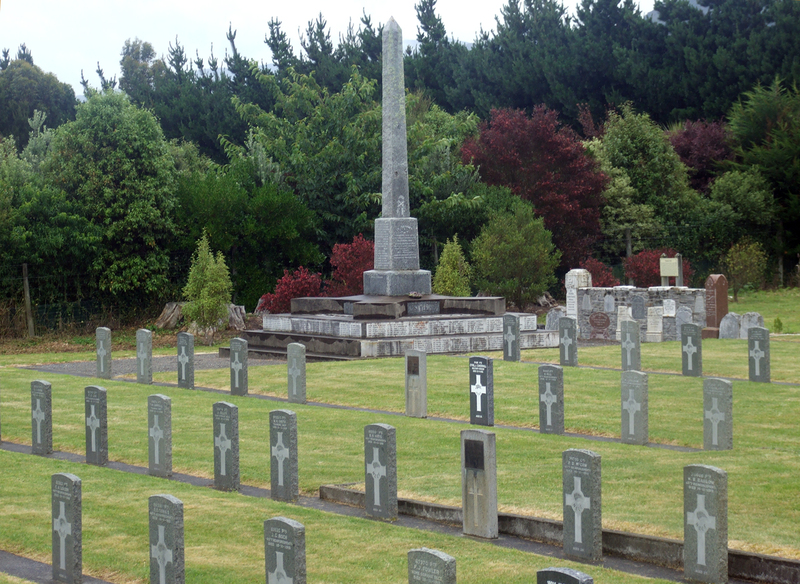 The Featherston Camp memorial obelisk at Featherston Cemetery. The names on the obelisk base are mainly victims of the 1918 influenza epidemic. New Zealand was badly affected by the 1918 influenza epidemic and Featherston Camp suffered over 160 deaths, almost all in November 1918. By mid-November 2,500 men were ill, overwhelming the hospital, and other camp became temporary hospitals. Men in military camps had been affected by influenza since 1915 but this was a mild version from which almost all recovered. The Spanish flu arrived in October 1918 and probably came into camp with soldiers returning from leave. By 6 November 299 men were in hospital. The Army cancelled the departure of the 44th and 45th Reinforcements and sent home new recruits. The first Featherston Camp death was 7 November, when over 400 reported sick. The number of sick peaked at 2500 on 11 November (the day of the Armistice) and the peak of daily deaths on 15 November when 19 men died. The numbers of sick quickly overwhelmed the hospital and the Soldiers’ Club, religious institutes, Anzac Club in Featherston and some barracks became temporary hospitals. Medical staff also suffered illness and deaths and some soldiers had to become orderlies. Most of the 164 dead were buried in Featherston Cemetery. The situation was complicated by the ending of the war. The health situation had already led to training in camp being badly affected. Now, those in training would not be sent overseas. Convalescent patients had to remain until the danger of passing infection was over. The pandemic receded as November ended. There were only 188 cases by 29th and the last death was on 11 December. There had been a death rate in camp of 20.5 per1000 – at the same time Hastings had a death rate of 9.21per 1000.